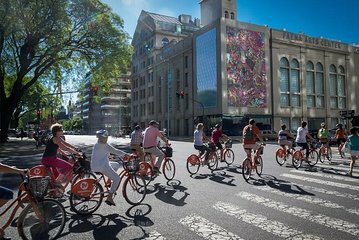 The colorful neighborhoods of south Buenos Aires offer an atmospheric backdrop to a cycling tour, but the maze-like districts are best explored with the help of a local guide. This bike tour will introduce you to the tango district of San Telmo, the famous La Bombonera stadium in La Boca, the modern waterfront of Puerto Madero, and the idyllic Costanera Sur Ecological Reserve. Meet your guide and tour group in the heart of San Telmo and saddle up for a scenic 9-mile (15km) circuit of the city. Start by exploring the historic district of San Telmo, with its cobbled lanes and lively Plaza Dorrego. Catch a glimpse of the neighborhood’s tango heritage as you pause to watch the street dancers, then escape the crowds to glide around the tranquil Parque Lezama. Continue to nearby La Boca, where the star attraction is the famous La Bombonera football stadium, and learn more about the Argentine passion for football (soccer) as you admire the home of Buenos Aires team, the Boca Juniors. Stop in the center. Continue to the waterfront of La Boca, where you’ll have a short break to stroll down one of the city’s most photographed streets, El Caminito, renowned for its brightly painted buildings and colorful street stalls selling art and handicrafts. Next, head north along the waterfront to glitzy Puerto Madero, a modern district full of business headquarters, glamorous restaurants, and chic bars. Pause to take photos of the unique Puente de la Mujer bridge, then swap the urban streets for the serene cycling trails of the Costanera Sur Ecological Reserve, a pocket of greenery, renowned for its varied birdlife. Loop back to San Telmo, stopping to admire the landmarks of Plaza de Mayo, Buenos Aires’ most important square, where you’ll see the Casa Rosada and El Cabildo, and hear about some of the key historical events that took place in the square. Finally, end your tour back at the starting point in San Telmo. Great guide and really nice way to see some parts of the city that were a little further away to the CBD. Monika was very helpful when we needed to change the time of our tour. Would definitely recommend this or any of the other tours through La Bicicleta Naranja.